Corporate special interest groups blanket the airwaves with a conceptual model of our economy as a machine that should be left alone and not tampered with. 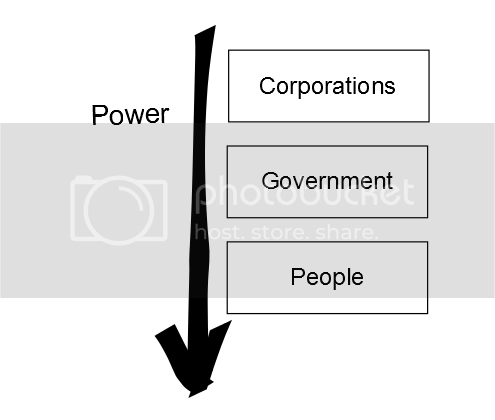 This model, or frame, encourages inaction and the view that government somehow “tampers” with the machine when it acts in any way, shape or form. This is, of course, ridiculous. We’ve always created rules for economies. Without them, we’d have black markets, a slave trade, child labor, company stores, and endless exploitation. How do we know this? History. These things happened until we fought against them and made markets better. They will happen again if we don’t fight. Yet many people who buy into this model of the economy as a machine are convinced that all we need to do is leave the machine alone and it will work better. Over and over the media repeats this to the point where many recite it as common sense. The best way to address the faulty model people are being taught in the media is to illustrate a better model. I’d like to see a commercial that says “here’s the problem, money in politics, and this is how things should work.” Without further ado, here’s commercial #02: Democracy. Ask most people in America how our country really works and it doesn’t take too long to get to the following picture. Government works for certain large, multinational corporate special interests and we, the people, are at the bottom. Large multinationals pour billions into organizations like the U.S. Chamber of Commerce and the American Legislative Exchange Council (ALEC) and these groups, in turn, help elect “friendly” politicians and pass legislation that benefits those at the top. The problem is, quite simply, money in politics. How do we fix this? Smaller government?